Call it maudlin or sentimental, but Dolly Parton’s song “Coat of Many Colors” is undeniably an American classic, so much so that it was adapted to a made-for-television movie in 2015 and to a sequel, “Christmas of Many Colors,” in 2016. The song is not particularly innovative artistically speaking. It doesn’t push the envelope in any way. And yet . . . it tells the story of the Parton family so honestly, vividly, and memorably – and does so in a neat, three-minute package. The song tells of the Parton family’s poverty, so profound that the only way Avie Lee Parton can provide a winter coat for her daughter is to stitch together one from old rags given to the family. As she sews the coat for young Dolly, she tells her the Biblical story of Joseph and his coat of many colors. Dolly can’t wait to wear the new coat to school. The joy and pride she feels in wearing the rainbow-colored coat are dashed when the other children at school make fun of her for her coat made of rags. Of course, as a good Nashville hit will have it, by the end of the song, young Dolly has learned a lesson in true love and pride in one’s family. Parton wrote “Coat of Many Colors” in 1969 while traveling on a tour bus with her singing partner, Porter Wagoner. The story goes that she couldn’t find any paper on which to write the song, so she grabbed a dry cleaners’ receipt for one of Wagoner’s suits. When the song hit it big, Wagoner had the receipt framed. It is now on display next to a replica of the original coat in Chasing Rainbows, the Dollywood museum dedicated to Dolly Parton’s life and career. The song was released in 1971 as the title track of Parton’s eighth album. Iconic and revered, “Coat of Many Colors” is without a doubt Parton’s “signature song.” It has been covered by Shania Twain, Emmylou Harris, and Eva Cassidy, among others. The Atlanta Journal-Constitution ranked it tenth on its list of one hundred songs of the South. 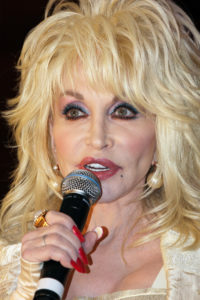 And in 2012, the Library of Congress added “Coat of Many Colors” to its National Recording Registry, a collection of sound recordings that the LOC describes as “culturally, historically, or aesthetically important,” recordings that “inform or reflect life in the United States.” Perhaps most importantly, “Coat of Many Colors” remains Parton’s own favorite of the more than three thousand songs she has penned since she began writing at age seven. When I worked at a hiking lodge in the Great Smoky Mountains National Park high atop Mt. LeConte, I was mesmerized by a photo history book of the area as it existed before it was made into a national park in 1934. Families had lived scattered throughout the rugged but spectacularly beautiful terrain. Among those original families were the Partons and the Ogles. Dolly Parton and Judy Ogle, as is told in the television movie, became best friends in school and remain so to this day. 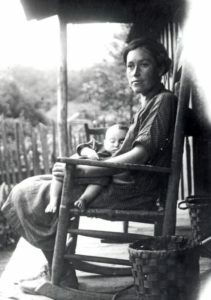 A 1928 photo of Molly McCarter Ogle rocking her baby makes vivid life in the area and is one of the most famous images of those who lived in the Smokies before the park was formed. Born in 1946 in Locust Ridge, a very small and remote community just north of the Greenbrier Valley in the Great Smoky Mountains, Dolly was the fourth of twelve children born to Avie Lee and Robert Lee Parton. Her mother was a singer and taught her young daughter religious music as well as the traditional ballads her ancestors brought with them when they settled in the Smoky Mountains. Raised as a Pentecostal in the Church of God, Dolly became a singing sensation at an early age. When she was thirteen, she appeared on the Grand Ole Opry, where she met Johnny Cash, who encouraged her to pursue her career in the way that felt right for her. The day after her high school graduation in 1964, Dolly Parton moved to Nashville. On her first day in the city, she met Carl Dean, her future husband, in a laundromat. Dean is now retired from his work paving asphalt roads in Nashville. And according to both Parton and Dean, he has seen her perform only once. Perhaps Carl Dean is one of the reasons Dolly Parton stays so rooted to her past despite the wigs and gowns and over-the-top makeup. What I love about Dolly Parton is that she spans two worlds that seem at once far apart and extremely close. As told in “Coat of Many Colors” and in the numerous interviews Parton has given throughout her long career, the Partons lived a hardscrabble life in Locust Ridge. Dolly Parton very much has one foot squarely planted in that mountain past. The fact that she feels a strong tie to her home and her people is made clear in her theme park, Dollywood, and her other business ventures in nearby Pigeon Forge, just a few miles from the one-room cabin where Parton was raised with eleven siblings. Parton employs many people at Dollywood who are descended from those original mountain families. But Dolly Parton also very much has her other foot planted just as firmly in the glitzy, glamorous, modern world of show-biz – Nashville, where she makes her home, and Hollywood, where she has made her films. She herself is larger than life, a walking, talking, singing coat of many colors. She embodies – literally – that in-your-face joy and fierce mountain woman pride. Dolly’s exceptional accomplishments – from recording numerous country and bluegrass albums to receiving a Grammy Lifetime Achievement Award, from making several films to being named to the Country Music Hall of Fame – are a testament to her ability to stay connected to her past while embracing the much wider world beyond Locust Ridge. In recognition of her many successes, Dolly Parton has received the Library of Congress’s Living Legend Award, the presidential National Medal of Arts, and Kennedy Center Honors. To learn more about Dolly Parton, visit the Library of Congress’s extensive digital archive about the Appalachian musician. Begin your exploration by reading the LOC’s biography of Dolly Parton. Then locate Locust Ridge exactly on maps of the Great Smoky Mountains. You can peruse a timeline of Parton’s life as well as a discography of Parton’s recordings. To place Parton’s career within the history of country music, take a look at the country music timeline provided by the LOC. Revisit this classic American song – and find out how even the glitzy, glamorous Dolly Parton brings life to her deep-seated mountain pride. Image Credit: Dolly Parton at a 2011 press conference. Used with permission from https://commons.wikimedia.org/wiki/File:Dolly_Parton_2011.jpg. Image Credit: Photo of Molly McCarter Ogle by Laura Thornburg, 1928. Used with permission from https://www.nps.gov/media/photo/gallery.htm?id=C42743FD-1DD8-B71C-07A2DCCEF65CCF33. I SO admire Dolly Parton. She is brilliant, she is generous, she is humble, she is gorgeous. I, myself, understand her love of the ‘cheap, trampy’ look. But I just adore her. Her talent is just immeasureable, in my humble opinion. Thank you for sharing this.. Thanks for choosing Dolly Parton to recognize in StoryWeb. She is truly worthy. An artist, a poet, a cultural treasure. America is better for her being one of our chroniclers.